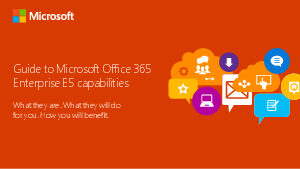 Office 365 E5 voice capabilities and what it could mean for your business. If you’re looking for a simpler, less costly approach to phone and business communications, E5’s voice capabilities can help you reduce office space, host larger meetings and collaborate more effectively. Here’s an overview of the benefits.